Funky folky americana... Winner of 1995 MUSICIAN MAGAZINE's Best Unsigned Band Contest. Karen and Pete recently scored brother James Savoca's beautiful first feature length film, Sleepwalk, which is currently airing on The Independent Film Channel. I'm hooked with the very first chords of the title track, On the River Road. As soon as i put it in and hear it start up, i know i'm in for a ride with great beats, the kind of groove that makes me want to move. The lyrics are very moving without being too serious. I've just put it in to get a feel for the album in order to review it, and i find myself having trouble skipping through songs, i have to listen to them all. Lucky You're Mine features a whispy, almost haunting sound, very soothing. Till My Heart speaks to me on a very personal level, a great song of longing and waiting for the return of love. Light a Candle has a very distinct groove, as most of the tracks on this disc do. One of the great things about this disc is that if i let it loop in the background, it can do so several times before i even notice that i've listened to the whole thing. Very funky and peaceful at the same time, a great accomplishment. Every cut on this CD has earned my respect! This MUSIC is proffesional, well written and unique. It pulled me in and held my attention. 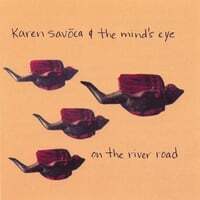 This was my introduction to Karen's and friends music and I find myself wanting more! Well Done! I have had this CD since it first came out. I had the DIVINE PRIVLEDGE OF MEETING THIS AMAZING WOMAN, and watch her do a soundcheck before a gig at a local nightclub. It was the first time I ever had SHIVERS from hearing someone sing. WOW. This is in my Top 5 favorite albums for life!!! I was introduced to this CD by a former boyfriend, who gave me a taped copy of the album. I just about wore that tape out. I've moved to digital music formats, and it's been a while since I have listened to my tapes, River Road included. Listening to this album for the first time in a long time, on CD, was special. It moved me, not just for memories that are associated with the music, but because the music itself is so great. Til My Heart just gets to me. Sanctuary, Eight Tons, such sweet stuff. Thanks, Stu O.